Yes, you counted right-- that's SEVEN tests. I wanted to be sure! If luck be a lady and I be that lady, then I am so knocked up right now! 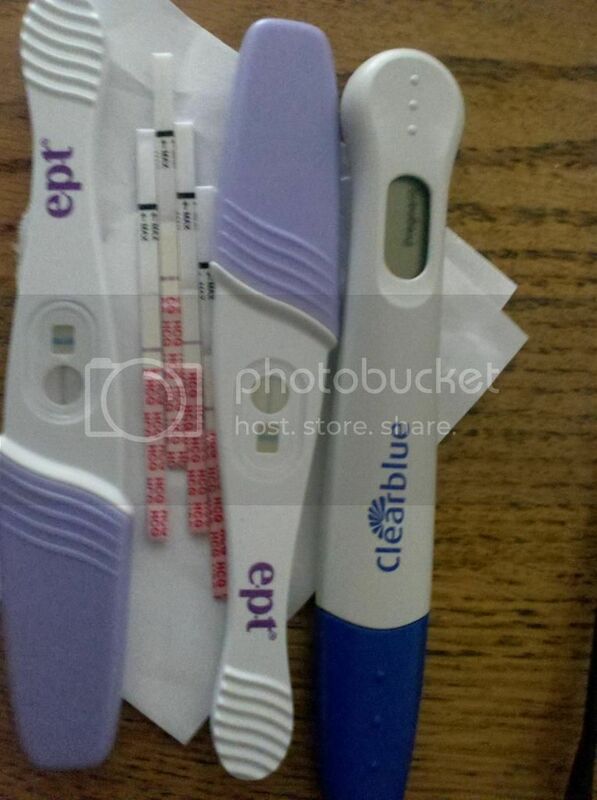 Despite the fact that we were on the look out for a double lined pregnancy test, it was still a shock to get one. Then to get another one and the one after that one… and 7 tests later, still seeing all the positive results lined up in a row, I’m in a state of disbelief. I feel so very lucky and oh-so-very scared at the same time. Though I’m obviously beating out the statistics for a woman my age in the conception department, it’s still very scary- all those statistics running around in my head. I know it’s possible to beat the odds, I just did it with the fabulously healthy little one-year-old running around my house. But will I beat the odds again?? I truly hope so. I’m 7 weeks along, or at least I think. Being me, things were not cut and dry. First off, I got an “inconclusive” blood test. Never even knew that “maybe pregnant” was an option for pregnancy blood tests! It did, after a few days and a retest, give me the positive I was hoping for. Our first ultrasound appointment, where we were supposed to see a heartbeat, showed that we were earlier than THEY thought. I’d have been freaking out, but I suspected with a certainty that I’d ovulated late. So now we’re waiting for our next ultrasound, which will be in a week. Posted in: Cougar Town Has Babies?!? ?.